Giovanni Fattori, possibly the most important painter of the nineteenth century in Italy, received his first instruction in drawing from a lesser painter of his native town. In 1846 Fattori moved to Florence to attend the Academy. 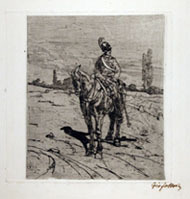 During the 1850s Fattori joined the innovative artists, called Macchiaioli, who met at the Caffè Michelangelo in Florence and were champions of a new technique and style to contrast the conventional academic language. During those years, he still produced works that could be attributed to the historical-romantic school but his interest in studying from life also extended to landscape painting and the military life of the day became the subject of his first experiments in painting using the macchia technique. In 1867, after the death of his first wife, Fattori frequently stayed in the Maremma region which became the ideal backdrop for his works. Fattori began etching in the early 1880s, when he was nearly sixty; quite soon he was able to appreciate the difference of expression he could achieve using this new medium. A real peintre-graveur, he continued with etching his artistic research on light and essential shapes in reality.